I'm a Small Business Technology consultant and back-end software engineer specializing in Golang, Web Applications, and DevOps. I'm a big supporter of Open Source software and make contributions where I'm able. I have 14+ years of business leadership and technical support experience in various technological environments. Strong ability to troubleshoot complex issues and identify solutions to streamline processes while managing a team. Currently seeking a Junior-developer, freelance and contract positions by demonstrating the following key strengths and areas of expertise highlighted below. As a team-member, created a micro-service based API using a variety of cutting-edge technologies to meet scalability and efficiency goals. Web and software development, network design, setup, & management, and small business solutions consulting. Specialize in small-business technology solutions including communication, inventory, sales, human resources, networking and healthcare solutions. Responsible for all aspects of the business including Human Resources, Customer Service, Bookkeeping, and Inventory management. Self-implemented numerous technology upgrades including Pharmacy Management system, Telephone, Network, Point of Sale and Security systems. I have nearly a decade of experience assisting small businesses with technology needs including Point-of-sale, networking, hardware, software solutions, training and more. I have created web applications for a variety of clients using backends in Python, Express.js, and Golang. Single-page applications and server-side render each has their advantages and I'm happy to assist with both. Specializing in Go development including serverless, API backend, command-line (CLI), and full-stack web applications. I have experience building applications of many types in Go from small-projects to full-scale production applications. Years of DevOps experience including basic infrastructure management, security, scripting, and task automation, as well as building custom tooling and solutions to reduce labor spent on repetitive tasks including continuous deployment (CD), continuous integration (CI) and testing. I have experience using Docker including both Kubernetes (k8s) and Docker Swarm for containerized application distribution and infrastructure management. From custom Docker image builds to distributed applications and database deployments. Whether you need a simple API connector or a full application with several complementary microservices and queued workloads, I'm certain I can help you meet your design criteria. Pursuing Bachelor of Science in Computer Science. Studies in Business and Software Development to meet degree requirements for Wayne State University. Full-Stack Immersive Web Development program focused on Python and MEAN stack application development. Opportunities to work on team projects and meet deadlines greatly improved previously self-taught skills. Hashify is a basic web application and public-accessible hashing API to generate hash digests of plain-text input or small file input to various output encodings such as hex, base32, and base64. 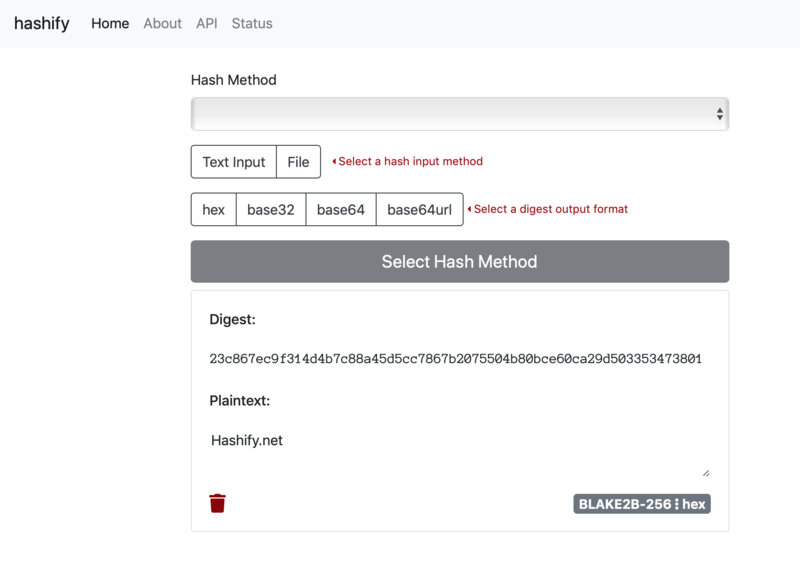 Hashify is a basic web application and public-accessible hashing API to generate hash digests, including Blake, MD4, MD5, SHA1, SHA2, SHA3, and Highway-Hash, of plain-text input or small file input to various output encodings such as hex, base32, and base64. A probably paranoid Golang utility library for securely hashing and encrypting passwords based on the Dropbox method. A probably paranoid Golang utility library for securely hashing and encrypting passwords based on the Dropbox method. This implementation uses Blake2b, Scrypt and XSalsa20-Poly1305 (via NaCl SecretBox) to create secure password hashes that are also encrypted using a master passphrase. 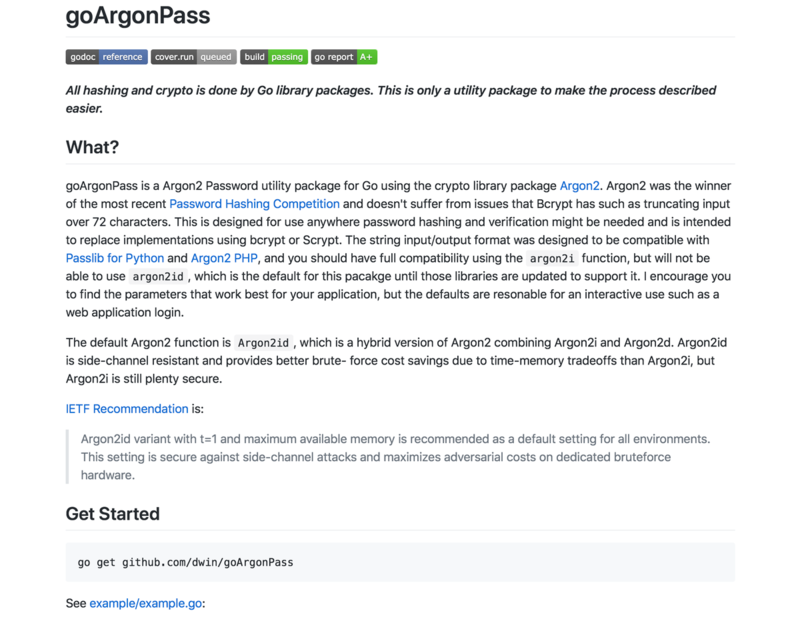 goArgonPass is a Argon2 Password utility package for Go using the crypto library package Argon2. 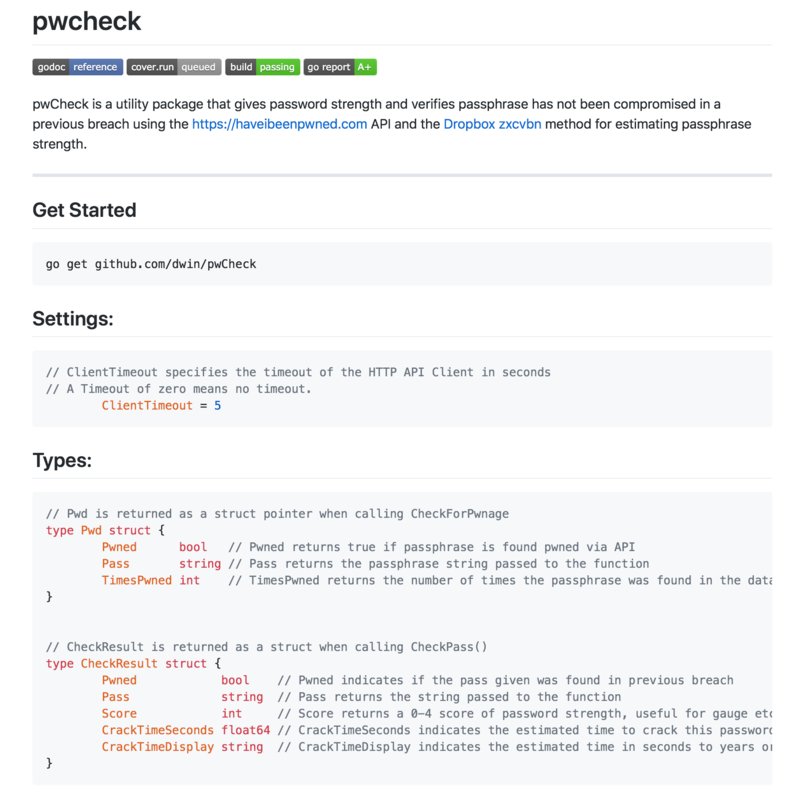 pwCheck is a Golang utility package that gives password strength and verifies passphrase has not been compromised in a previous breach using the https://haveibeenpwned.com API. 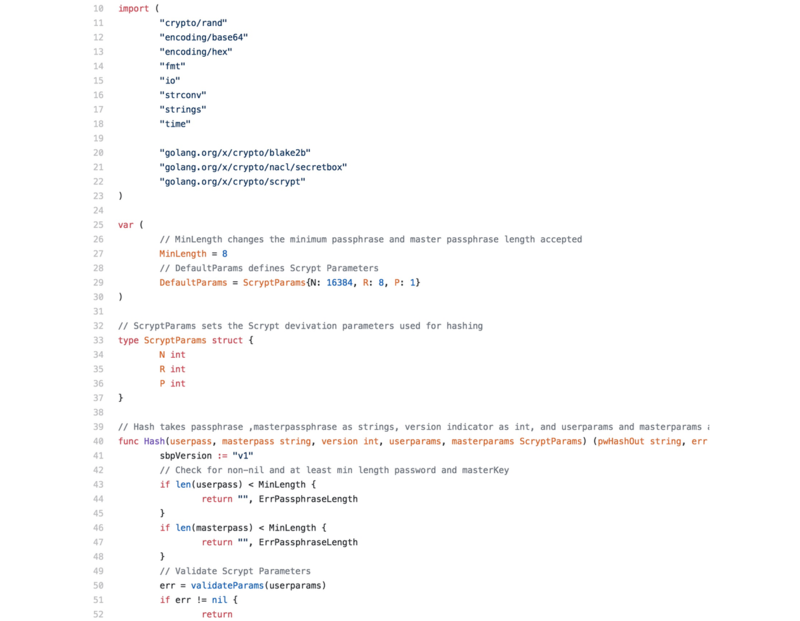 pwCheck is a utility package that gives password strength and verifies passphrase has not been compromised in a previous breach using the https://haveibeenpwned.com API and the Dropbox zxcvbn method for estimating passphrase strength. © 2018 Darwin Smith II. All rights reserved.